3 Bedroom 2 Baths With Water Views From Your Living Room & Bedrooms. This home sits on the edge of a high bluff with unobstructed views of the water and a secluded cove with direct access to a beautiful private beach. You do not have to leave your living room to feel that you are in nature. This Ca. 1960 two story cottage was fully renovated in 2015 with central air and all other modern amenities. There are glass panels that are 14 ft wide in the living room and other floor to ceiling glass panels and sliding doors that welcome the endless sunlight and cross ventilation. The property is very private with a landscaped garden and many flowering perennials, the green lawn leads to an infinity deck, ideal for sunset dining and your morning coffee. Home sits on a high bluff with unobstructed water views from the living and bedroom areas. This home is on the Long Island Sound and has a private beach. Custom shaker style kitchen with microwave, dishwasher. Very private fully equipped kitchen, garden dining table and beach chairs available for lawn and private beach. We had an incredible stay. The location is amazing. Listening to the waves every night and morning. The house was beautifully landscaped with incredible views for sunsets and sunrises. The beach is down a staircase well equipped for lounging, swimming and fishing and we rented kayaks and launched them from the beach each day. Great proximity to Greenport for town and great food, town green, carousel and walking around. The hosts were very welcoming and personally showed us around with instructions. We can’t wait to return again and would highly recommend this house for anyone looking to stay on the beach with access to a lovely house and all that the beach has to offer with plenty of space to relax and enjoy the amazing North Fork. This is a perfectly located, well-maintained, and fully stocked beach cottage. Its design, including the large windows all around, and its decor are refreshing in and out. Beautiful views of the Long Island Sound from sunrise through sunset. The owners generously provided everything needed in the kitchen and bathrooms. Everything was very clean. With the exception of occasional landscapers working in the neighborhood, expect complete quietness. 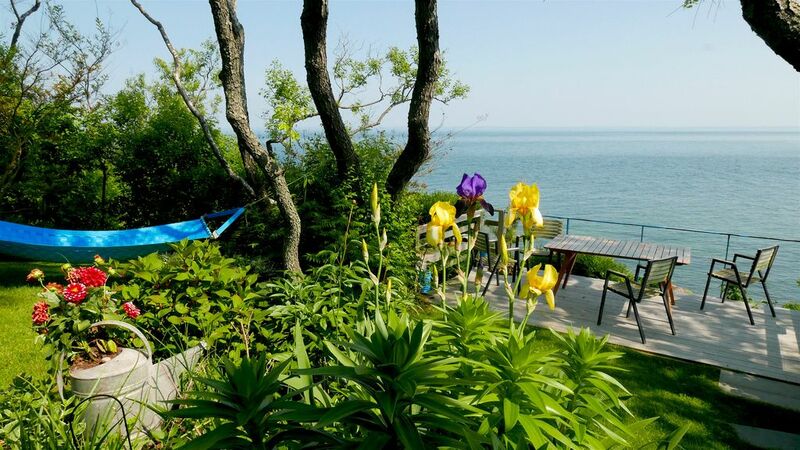 The backyard with the hammock and the deck overlooking the beach is a wonderful hangout. The private, pebble beach is a perfectly manageable stair climb. Good quality beach chairs, umbrella and towels are provided. There was an unexpected problem that came up but it was dealt with immediately by the owner and did not really interrupt our stay. Trash and recycling collection is also arranged from the property itself by the owner, which is often not the case with other rentals in the area. (With other rentals we were asked to carry garbage to the side of the road or another fairly remote location.) The location is also great; the cottage is close to Orient Point (with its park and beach), Greenport (with multiple good dining, shopping, and ice cream options, as well as the ferry to Shelter Island), a number of good farms (for fresh local produce and baking goods) and wineries. There are also other dining and hangout options in and towards other nearby towns (on route 25), such as Southold, Cutchogue, and Mattituck. Overall, this cottage is a great option on the North Fork! Highly recommended! !